For other uses, see Etrog (disambiguation). Etrog (Hebrew: אֶתְרוֹג, plural: etrogim) is the yellow citron or Citrus medica used by Jews during the week-long holiday of Sukkot, as one of the four species. Together with a lulav, hadass and aravah, the etrog is to be taken in each hand. While in Modern Hebrew etrog is the name for citron of any variety or form, whether kosher for the ritual or not, its English usage applies only to those varieties and specimens used as one of the Four Species. Some taxonomic experts, like Hodgson and others, have mistakenly treated etrog as one specific variety of citron. The various Jewish rites utilize different varieties, according to their tradition or the decision of their respective posek. On the first day you shall take the fruit of majestic trees, branches of palm trees, boughs of leafy trees, and willows of the brook; and you shall rejoice before the Lord your God for seven days. Rabbinic Judaism believes the biblical phrase peri eitz hadar (פְּרִי עֵץ הָדָר) refers to the etrog. Grammatically, the Hebrew phrase is ambiguous; it is typically translated as "fruit of a beautiful tree," but it can also be read as "a beautiful fruit of a tree." Etrogs are carefully selected for the performance of the Sukkot holiday rituals. 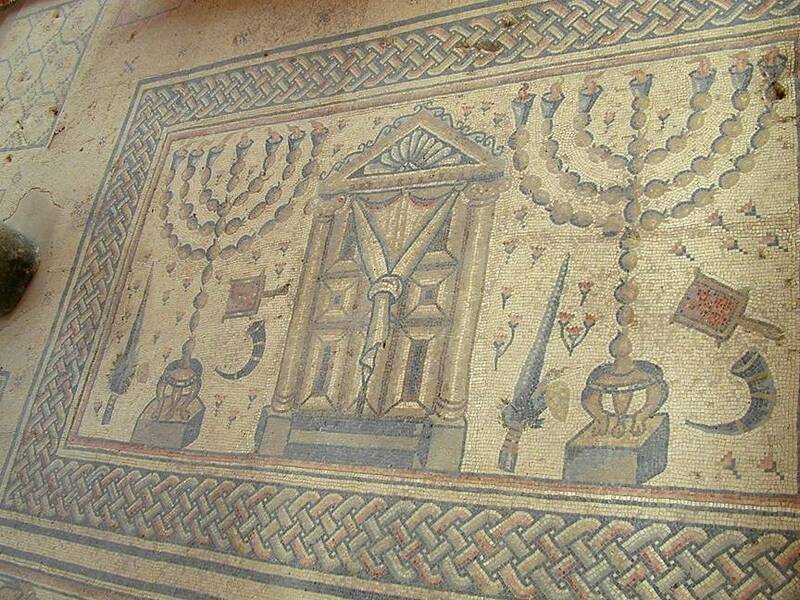 Original mosaic of ancient Maon Synagogue (before the 6th century CE), depicting etrogs at the base of a menorah. Replica of Maon Mosaic in Or Torah Synagogue. A similar replica is placed at the yard of Yad Ben Zvi. 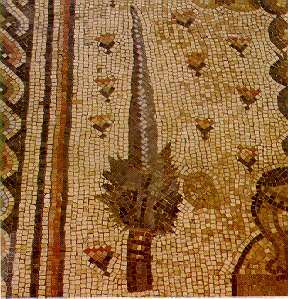 Ancient Mosaic of Beth Alpha Synagogue, depicting etrog alongside a lulav, shofar and a menora. The four species near a Shofar and Menorah, also found in the ancient Hamat Tiberias Synagogue. Ancient mosaic of Tiberian Synagogue, today in Eretz Israel Museum. Bar Kokhba silver coins depicting lulav and etrog. Replica of a coin of The First Jewish-Roman War depicting lulav and two etrogs. In modern Hebrew, hadar refers to the genus Citrus. Nahmanides (1194 – c. 1270) suggests that the word was the original Hebrew name for the citron. According to him, the word etrog was introduced over time, adapted from the Aramaic. The Arabic name for the citron fruit, itranj (اترنج), mentioned in hadith literature, is also associated with the Hebrew. Etrogim have been cultivated in the Holy Land extensively at the times of the Second Temple and are found in many archaeological foundlings of that era. Those include mosaics of Maon Synagogue, Beth Alpha Synagogue, Hamat Tiberias Synagogue and more. In all those sites it is depicted alongside other important religious symbols, like the Shofar or Menorah. It is also found on numerous Bar Kokhba coins. The earliest reference to etrog in the holy land is still the recent discovery of citron pollen that was found in excavations on the Ramat Rachel site. Sometime during the first century BCE, Alexander Yanai, the sixth and last of the Maccabean rulers, who also appointed himself to the high priesthood, was pelted with the native balady citrons for cheating on the rabbinical interpretation of the mitzva of nisuch hamayim that the priest should have commenced during the Feast of Tabernacles. After the fall of Jerusalem in 70 CE, exiled Jews planted citron orchards wherever they settled: in Europe (Spain, Greece, and Italy) as well as in North Africa and Asia Minor. Jews who settled north of warm citron-growing areas were dependent on imported etrogim, which caused much anxiety given the dangers and uncertainties of sea travel. By the seventeenth century some of the most popular sources were the islands of Corsica and Corfu. Jewish communities in Europe and America then turned to Palestine, where etrog farmers had been marketing etrogim to Europe since the late 1850s through The Fruit of the Goodly Tree Association. Some Jewish communities still preferred citrons from Italy, Greece, Morocco, or Yemen, but many Jews seeking citrons turned back to Eretz Yisrael, the land of Israel. These days, American Jews continue to import the majority of their holiday etrogim from Israel, besides during Shmita when there are some halachic problems exporting the produce of Israel. A pitam or pitom (Hebrew: פיטום) is composed of a style (Hebrew: "דַד" dad), and a stigma (Hebrew: "שׁוֹשַׁנְתָּא" shoshanta), and usually falls off during the growing process. An etrog with an intact pitam is considered especially valuable, but varieties that naturally shed their pitam during growth are also considered kosher. When only the stigma breaks off, even post-harvest, the citron can still be considered kosher as long as part of the style has remained attached. If the whole pitam i.e. the stigma and style, are unnaturally broken off, all the way to the bottom, the etrog is not kosher for ritual use. Many more pitams are preserved today due to an auxin discovered by Dr. Eliezer E. Goldschmidt, emeritus professor of horticulture at the Hebrew University. Working with the picloram hormone in a citrus orchard, he unexpectedly discovered that some of the Valencia oranges found nearby had preserved perfect pitams. Citrus fruits, other than an etrog or citron hybrid like the bergamot, usually do not preserve their pitam. On the occasions that they do, their pitams tend to be dry, sunken and very fragile. In this case the pitams were all fresh and solid just like those of the Moroccan or Greek citron varieties. Experimenting with picloram in a laboratory, Goldschmidt eventually found the correct “dose” to achieve the desired effect is one droplet[clarification needed] of the chemical in three million drops of water. This invention was highly appreciated by the religious Jewish community. In order for a citron to be kosher, it must be neither grafted nor hybridized with any other species. Only a few traditional varieties are therefore used. To ensure that no grafting is used, the plantations are kept under strict rabbinical supervision. The citron varieties traditionally used as Etrog, are the Diamante Citron from Italy, the Greek Citron, the Balady Citron from Israel, the Moroccan and Yemenite Citrons. A general DNA study was arranged by Eliezer E. Goldschmidt and colleagues, who positively testified 12 famous accessions of citron for purity and being genetically related. As they clarify in their joint publication, this is only referring to the genotypic information which could be changed by breeding for e.g. out cross pollination etc., not about grafting which is anyway not suspected to change anything in the genes. Cross section of the Lefkowitz variety showing the signs for purity. The Fingered and Florentine Citrons although they are also Citron varieties or maybe hybrids, are not used for the ritual. The Corsican Citron was no longer in use, but has recently been reintroduced for ritual use. In addition to the above, there are many rabbinical indicators to identify pure etrogs out of possible hybrids. Those traditional specifications were preserved by continuous selections accomplished by professional farmers. The most accepted indicators are as following: 1) a pure etrog has a thick rind, in contrast to its narrow pulp segments which are also almost dry, 2) the outer surface of an etrog fruit is ribbed and warted, and 3) the etrog peduncle is somewhat buried inward; a lemon or different citron hybrid is opposing one or all of the specifications. A later and not so widely accepted indicator is the orientation of the seed, which should be pointing vertically by an etrog, except if it was strained by its neighbors; in lemons and hybrids, the seeds are positioned horizontally even when there is enough space. The etrog is typically grown from cuttings that are two to four years old; the tree begins to bear fruit when it is around four years old. If the tree germinates from seeds, it will not fruit for about seven years, and there may be some genetic change to the tree or fruit in the event of seed propagation. To protect the etrog during the holiday, it is traditionally wrapped in silky flax fibers and stored in a special box, often made from silver. After the holiday, eating from the etrog or etrog jam is considered a segula (efficacious remedy) for a woman to have an easy childbirth. A common Ashkenazi custom is to save the etrog until Tu Bishvat and eat it in candied form or as succade, accompanied by prayers that the worshiper will merit a beautiful etrog next Sukkot. Some families make jam or liqueur out of it, or stick cloves in the skin for use as besamim at the havdalah ceremony after Shabbat. The Dancing Camel Brewery in Tel Aviv, Israel, uses the rinds of etrogim in its annual 'Trog Wit Beer, usually available around the Holiday of Sukkot. Cross section in variety etrog citron, and in Fingered citron. ^ "Israel News - The Jerusalem post". www.jpost.com. A brief documentation of this study could be found at the Global Citrus Germplasm Network Archived 2008-04-10 at the Wayback Machine. ^ Weisberg, Chana (2004). Expecting Miracles: Finding meaning and spirituality in pregnancy through Judaism. Urim Publications. p. 134. ISBN 9657108519. Wikimedia Commons has media related to Etrog. Know Your Etrog, website with educational pictures, information how to plant your own tree. The Symbolism of the Lulav and Esrog, various sources explaining the symbolism and meaning of the etrog.